Relax, roll up your sleeves and get stuck in the Nando’s way! The flame-grilled PERi-PERi chicken is legendary. Cooked to order in a choice of spicy bastes ranging from the mild Lemon & Herb to the tongue-scorching Extra Hot, there’s a style to suit all tastes. 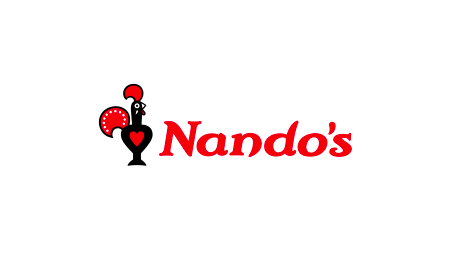 A quick lunch, a family party, an evening with friends – whatever – Nando’s menu, brimming with tasty appetisers, side dishes, salads and desserts, is the business. Bottomless soft drinks are fun for kids and the sharing platters are excellent value. Add beers and quality wines galore and the picture’s complete. For a unique flavour in cool surroundings, welcome to Nando’s.